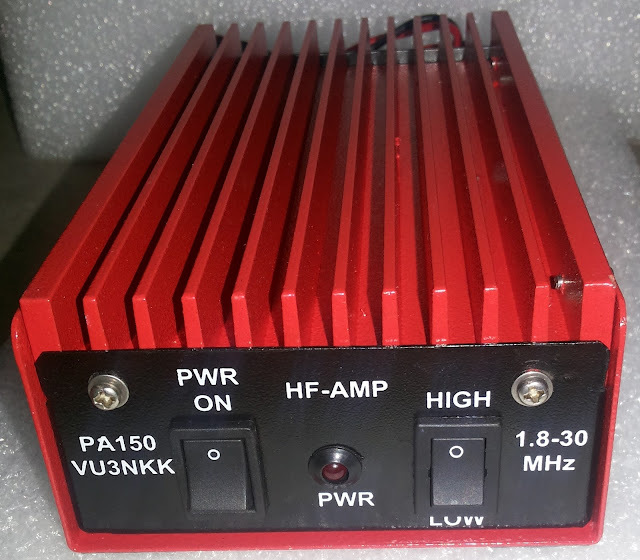 The PA150 is a 200 Watts SSB/CW rugged HF Linear amplifier units that will give many years of hard working service latest and smallest amplifier. This model PA150 amplifier has outstanding performance in its class and represents truly exception value for money. In this, we can not use ssb mode as it is. We have to add bias circuit & also ptt interface. In PA150 the above is builtin & delivers good RF power output. We have done only proto type 2pcs sofar & tests are going on. The price of this, we have not yet calculated & made available soon. I am using TC300 without modification getting 250watts ssb rf power out on 14mhz. TC300 is basically class C amplifier. During it's operation in ssb, the audio will not be as smooth as class AB amp. Every half cycle ,there may be a slight distorsion noticed. In the case of class AB amp (biased like all commercial TX, bias current 200 to 25o mA), the audio will be smooth. In your observation of power output 250W in ssb, what is the corresponding voltage & current readings. Please provide this details. I have tested TC300 & Homebrew PA150 using RadioShack power meter with dummy load. all the above models are AM/SSB models. Specially designed for CB Radios. How does your Amplifier rate compared to RM Italy which is considered Worlds Best. i am looking for few amplifiers for my Base , office and car. Madhu Mohan is my tech consultant for this project. welcome to send me detailed email with all your inputs. Regarding KL300P and TC300,circuit & performance wise almost one & same with class C Amp type. The only difference between these two are - KL300 has Antenna pre amp & TC300 is not having this. In ssb operation both will have similar problem in audio quality with adopted class c type. In PA150, the Amp is class AB1 simmilur to our ham rigs ensures a clean audio reproduction. In this no pre amp inclued as in KL300. At the outset I commend you this nice project. The prototype version looks very professional. Amateurs who operate portable will find this exciting especially since the current drawn at 25W RF out is around 4 Amps (12.2V). Will appreciate knowing on what bands these tests in the test report were carried out. Did you notice that the performance was similar across the spectrum? Are you planning to incorporate any BPF's or filtering in the final version? Looks great! What about SWR protection? Is it not a must? Band pass filter /Digital read out-Bar graph - SWR /Power meter and SWR Protection will be available as an add on unit. Cost of the unit available soon. I feel you should sell the kit only with the BPF+SWR Protection cct. The Digital SWR & Pwr meter with perhaps VCC and I can be an optional add on. Will be in CBE this friday, and would be delighted to have a look. How about another version where 2 combine 2 such modules and get the full 400W which General grade hams can use. It would also be nice if you can show spectral display photos on various bands with 2 tone input to shoe 3rd order IMD range. And also 5 minute key down temperature rise / power output variation. Please also specify TR Switching time. Oh - That will be really fantastic! Looking forward to it. Is it possible to adjust RF Output? I heard them testing on 7065 today with different inputs and measuring the outputs. Being a local station I was getting the Linear signal like a gallon of power. There was no complaints about the audio quality. Congratulations for the team who burnt some midnight oil to make the dream come true. HAPPY MORNING TO VU3NKK AND VU3GEK !!! Looks Professional. keep your Contributions go on. duty cycle PA , which can be cranked up to the 200 watt levels to work or break into a pile-up. I did find a 2 s point difference between your min input and max input. 59+ when upto +20 and +30 db. I think you will have change the audio settings of your KX-3, it was very bassy, the mids and the highs were missing. Congrats on the fine job. Very happy to hear and thanks to VU3NKK and VU3GEK .. I would like to buy one .. Can I adjust the output power 100 w to 150 w levels .. and below of these levels ? Thanks for your suggetion on RF activation of ptt like RM italy rig. I have used that actuation earlier and it was found that not suitable for ssb operation. Highly irritating in ssb mode, if you reduce your modulation, the transmision stops and it will again pickup when you raise the modulation level with small delay leads to disconnect of your audio. In case of PTT line, it is available in all rigs, one has to take only the single wire of ptt line to amp. During ptt ,this line goes low and activates amp instantly and no break in communication as long as ptt is pressed. In the case of AM or CW the rf activation used in RM Italy is ok. Hope you understand the reason now. vu2pth is using speach proceser, which will have its own properties and nothing to do with the amp. As far as this amp is cosidered the audio o/p is equal to his ICOM commercial amp or his version slightly better. This is a first step we steped in and further add ons like LPF will follow shortly. Use SO-239 instead of BNC for feeding RF at the input. Once again another Great dedication from you, my God father! I remember the old days when you stood along with me and brought me up to enjoy the hobby. The Ice cream cups -me and ENB, shared with you all in that shivering cold evening at Kodi Repeater site...etc. Gone through the comments. Yes! kit form is always welcome, to share the thrill of 'I done it'! The addition of Preamp is also a suggestion that to be considered. I am keen to check it with the latest Pactor 4 (P4) HF digital mode, where the PTT switching time play an important role. so waiting for my boxes to arrive. Best wishes and keen on the further boxes you promised soon! Congratulations ! ! We need this in VU land. Wish you shall make and export a quality Linear at competitive price as next project. I am vu3btn from kochi working as Sub Engineer ,KSEB. PA 150 with my home brew RM 96 is getting good report.I think my RM 96's final is to be tuned for 7 mhz for clean and more power. Tnx for your good effort. 1.Relay chatring when dc is above 13.5v.so can't increase the volt to 14 v.
2. In the circuit given ,no matching seen for 50 ohm input.so any problem? 3.what is the real input impedance at 1.8,3.5,7,14,21,28 mhz. For RM96, why you need a 50ohm matching at PA input?? You are giving only 5W to the PA from your RM96!! RM96 is having a military grade construction, with which you can transmit to any unmatched antenna!! More over, at 5W power, no worry of SWR.... nothing going to happen for a TRX. So don't worry about other band input impedance also as the drive is only 5w. I am using it here with out any problem, and getting good pileup on 20M. The relay chattering is due to insufficient power supply used. When PTT is pressed the DC Voltage should not come down. Kindly check your power supply and current readings. The input impedance of the transistor varies corresponding to the frequency. This MRF247 power transistor is designed for 12.5 Volt VHF large–signal amplifier applications in industrial and commercial FM equipment operating to 175 MHz. For 1 MHz to 30 MHz there will be a large S Parameter variations and its corresponds to frequency. For HF Band you can operate this Amplifier and the SWR will be less than 3 for all bands. Don’t worry about input impedance. The output low pass filters are available with me in single or multiband package. You can add this low pass filter with PA150. Thanks for your kind feedback that you are getting good report with your RM96 & PA150. Please let us know the current taken by PA150 during operation. It should be from 15A to 20A depending on the RF drive. If Amp is drawing more current than this & your SMPS is not able to support the current, then the relay chattering may occur. Very importent is the DC current should be kept at 20A & less. Use of cooling fan when it is on is a must for giving trouble free operation for years to come. there is no impedence matching net work provided in this amp. If you want, you can add a 3 or 6 DB attunator from TX to Amp line, there by you can match the SWR better than 1:1.5 in all the bands. But incase of 3db attunator you have to increase RF power by 2 times say 10Watts & for 6DB attunator 4 times RF power say 20Watts instead of 4 to 5 watts. The swr readings of TX to Amp will varry from 1:1.3 to 1:6.0 in different bands. SWR in majority of the bands are less than 2.20 only. Even if swr is max 6 , with max power of 5Watt in certain bands, the Tx will comfortably handle the situation. 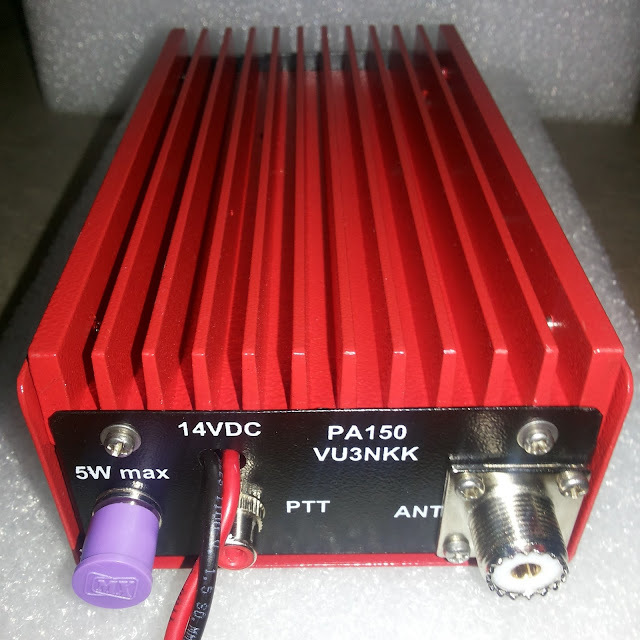 Dear Ganesan, I am using the PA 150 with SMPS powersupply and input is 5 watts from HB1AB youkits qrp transceiver. I am getting 25 Amps current from the DC 12.5 volts power supply. So I assume that about 200 watts is going out. On 40 metres I worked a Texas station who was on a contest last Saturday. My 40 dipole is in a awfully bad condition. This week I will improve my 40 and 20 antennas and hope to work lot of dx stations with my QRP transceiver connected to the PA 150. Thanks to NKK and GEK for their hard work to help VU hams who were dreaming for working dx. Thanks to all the friends for their kind feed-backs on the product performence in the field usage with different situations. We take all the feed-back positively for our reference and try to put our efferts towards possible improvements in the future model products. Congrats and keep up the good work. 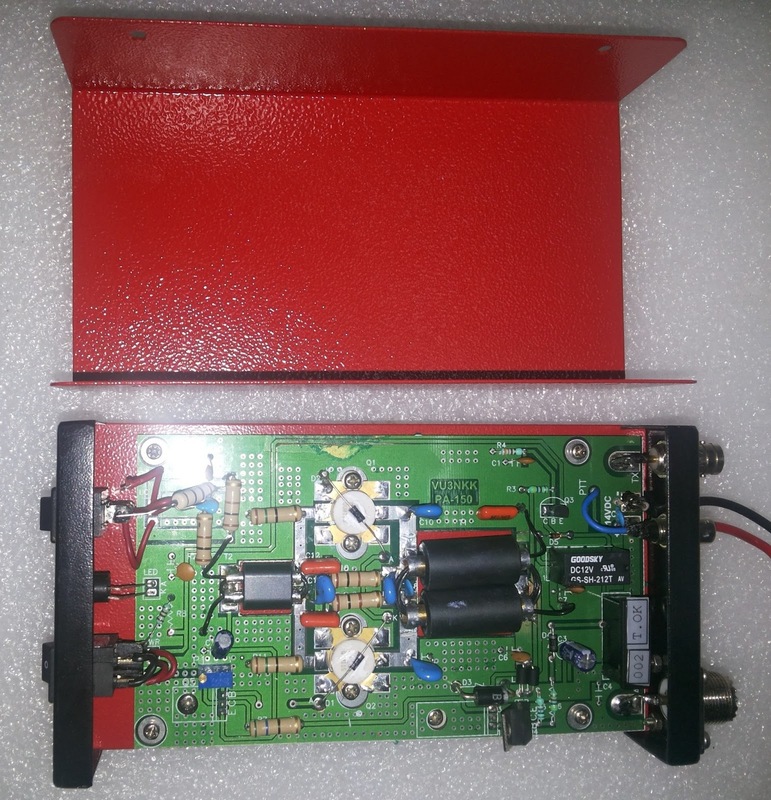 Nice to note that some good stuff is being made in VU Land and at an affordable price so that more stations can be heard louder and encouraged to have more QSOs. Cheers to you and Ganesan also. Yesterday I worked VK3OT on 20 metres cw using my HB1B QRP cw transceiver with PA 150 at 650 p.m. Bothways 559 rprts. Condition was poor and contest was going on. My antenna is an apology to a dipole. this blog is exclusive for user comments feed back of the homebrew products developed by myself and Krish, kindly give comments only on these products only. Kindly avoid posting of other products in this blog. Very glad to know that a low cost linear is available for Indian Hams. However, I have some doubts about the given specification of the amplifier. It is also claimed that for 200 Watts output the input DC power is 210 watts ( 14V x 14A). With reference to the datasheet of MRF247, the typical efficiency is 60 %, which means that for 200 Watts output power, the input DC power drawn must be arround 330 Watts. Your observation is right on MRF247 on typical power gain is 8.5. But this indicated gain is at higher frequency 175 MHZ. Where in we are using 1.8 - 30 MHZ frequency level the gain is more than specified 175MHZ range. When PA150 is supplied with 14.0 VDC, the current drawn will be 22 Amps typical for an RF i/p of 5W. So dc i/p will be 308W. The efficiency of MRF247 is enhanced when it is operated in lower frequency region. Using this transistors, other DX manufacturers claiming 300 W PEP. In our experience this particular Transitors are proved as very good & rugged in handling high Antenna SWR as high as 1:6 cases also. I have worked accidently for more than one week without knowing that one side lim of inverted V antenna was fallen in the ground due torain & heavy wind. But the current was more around 24 A at that time. Still my first pc is working OK now. This has iniciated to go for serial fab of PA150. 1. The Power Gain versus Frequency curve shown in the MRF datasheet clearly indicates that the power gain is maximum around 165 MHz and reduces at lower and upper frequencies. Surely the gain will be lower than 7 db at HF. 3. If your claim that at HF the performance is better than at VHF, Motorola would have marketed the same transistor as HF power transistor. 5. In PA150 Spec, the power rating 150 is the PeP or the Average power? If PeP, then what is the Continuous power rating? The power gain versus frequency curve shown in MRF data sheet refers to its max power gain ,when used in the test circuit of VHF region. This circuit condition is not applicable to HF operation region. Hence the indicated graph is not applicable to HF circuits. You can say that claim of commercial amplifier 300W PEP is fake one, but I can't comment on this, since both are different product line and transistors are different. You can see the test vedio, of PA150 in you tube url: http://www.youtube.com/watch?v=tDBUdOVIMR8 regarding output power level. I am not an expert in RF area. Please give your clarity on the power level in the RF power meter Radio shack 2000W/200w/20W with average power switch selected. The test readings can be seen in the blog dated 23-08-2013. Every day is learning process & one get updated knowledge. 1, In Class A amplifier for a 10 Watt output using 1 X transistor direct coupled will have efficieny 25%, DC power input 40W, Transitor dissipation 20W. 2.In Class A amplifier for a 10 Watt output using 1 X transistor transformer coupled will have efficieny 50%, DC power input 20W, Transitor dissipation 20W. 0.2 x Pl= 2watts/transistor. Thus for 200W amplifier using pushpull mode 0.2 X 200 = 40W/ transistor. Hence use of 75 W transistor is more than adequate. We are trying to home brew quality produts for our own / friends use. The test datas are raw & unaltered, as observed by us in our environments. We shall continue to put our efferts to the satisfaction of our own inner soul!! I had posted a reply to your email id. Dear Friends, Theoritically it may not work. But It is working for me both on 40 and 20 CW and as the current was going above 25Amps, I got the bias adjusted for cw operation and now on low power the current is 10 Amps and on High power the current is 20 Amps. I worked YO3AAJ last night with 599 report. Many europe stations are calling me when I put a CQ call. If I improve my antenna I should be able to work more dx on 7 and 14. I am using HB1B QRP cw transceiver with PA 150. My antennas are dipole for 40 and inverted Vee for 20 30 feet above. F6ARC, F5PNM, IK2AH, IZ2UBV, W1RM(CONNECTICUT,USA EAST COAST), I2NOI, VE2WU(CANADA). There were so many stations calling but it was 3 a.m. So I closed down and went to sleep. My antenna is yet to be trimmed for minimum SWR. I am working DX after a long gap with the help of PA 150.Thanks Ganesan and Krish. Your contribution is great ,both in price and technology. Kindly clarify the efficiency of of Class B and AB as far as theory and practical are concerned. Thanks for your kind feed back on the 35th pc of PA150. 36 th pc was sent to DX land ( G land ). Can you update, the input DC volt & Current readings at the observed power levels. This feed back will be usefull in calculating efficiency in the field condition. I used PA-150 with a drive from 4w QRP with excellent results. I even tried with the driver stage of a presently ongoing qrp project to drive PA-150 and the results were amazing. I am sure this moderately priced project is very useful for an ordinary indian ham, especially homebrewers/Qrp enthusiasts. I thank Krish and Ganesan for bringing out this wonderful gift to indian ham community. And I am sure that many more VUs will be heard overseas with this wonder box. an active qrp cw op wishing to be anonymous. Dear Friends, I am using the PA 150 from Day 1 and I am getting lot of dx in the night on 20 metre. My transceiver is HB1B with an output of 5 watts. I am getting all Europe, JA and W stations. But today at 544 pm. the band was in a poor condition and I heard one W3DF calling CQ on 14010 which is my favourite frequency. He was 579. I called him W3DF DE VU2DX VU2DX AR. I was surprised that he came back to my call and we had a nice QSO with 579 report bothways. I had been to Maryland which is his QTH and he said he is using a yagi beam on a tower and beaming it through long path. Just for curiosity I checked the google map and found that our signals have travelled around the world via south pole for a distance of 40000 kilometres. That is just thrillilng to me and amazing performance of the PA 150. In the 70 s I have worked Dx pile ups and W pile ups using FL 2000 B linear (Yeasu) and even at that time I did not feel so happy as now because now I am using our own Indian made linear and a simple dipole to work around the world. Congratulations to Krish and Ganesan who made this dream come true. could you clarify if in the PA 150 the output low / band pass filters are built in for each band or do we have to use it externally? Low pass filter should be added externally addon available with Ceramic / Mica capacitor/ mono /dual and all band configuration.. Enjoying the Amplifier for the past couple of months. Restricted to a shortened Inv Vee on my balcony which is ably complimented by the additonal 50 watts out of the Amplifier.Proud to own and operate a product Made in India ! (a) an external Low Pass filter with mica capacitors. What do you think I should buy, mono, dual or all band filter ? (b) upgrading the current class C amplifier to class A. Please quote me your price. We will discuss shipping cost to Singapore at a later date.